We’re not trying to be provocative here, despite the current trend of supporting lost causes and categorically sniffing at anything popular. Nevertheless, in the case of instant messaging services, time has already shown that WhatsApp is full of holes and Telegram, despite its lower popularity, is way ahead. Luckily (and since in fact we are defenders to the death of lost causes), you have us here to give you this list of 12 reasons you should switch to Telegram. Photos and videos with no size limit: Although WhatsApp has increased the maximum size of the videos you can send, as of Telegram’s version 2.4 its upper limit is 1.5GB, and you can send your uncompressed photos in their original size. PIN to block the app: Version 2.5 has added the option to enter a code to open the app. Integrated photo editor: The latest version has added a native editor to resize, crop, or edit the balances of images before sending them. 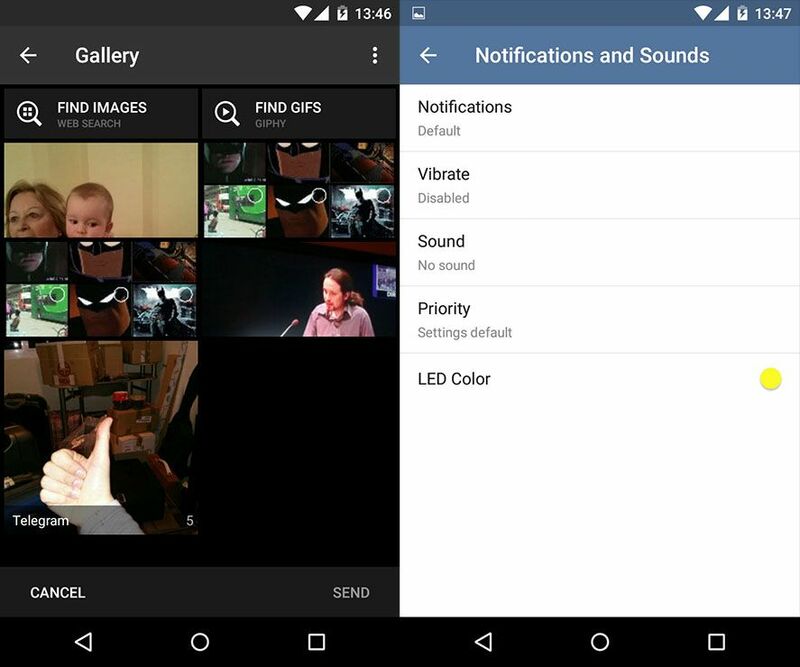 Custom notifications: While on WhatsApp you can only mute groups for a certain period, Telegram goes much further by letting you enable or disable notifications or vibrations, and select a custom sound or even the color you want to flash on the LED of your device. It is a non-commercial Open-Source project developed by Nikolai and Pavel Durov, creators of the successful social network VK, while WhatsApp belongs to the Facebook giant. It has a desktop client: It’s true that WhatsApp has just launched its desktop client, but Telegram has always been a cross-platform project with official clients for smartphones and PCs, including all operating systems: Android, iOS, Windows Phone, Windows, Mac and Web version. Selft-destruct messages: Similar to other apps like Snapchat, Telegram offers the option to destruct messages after several seconds. Send any type of file: WhatsApp only lets you send pictures and videos (and only specific formats). 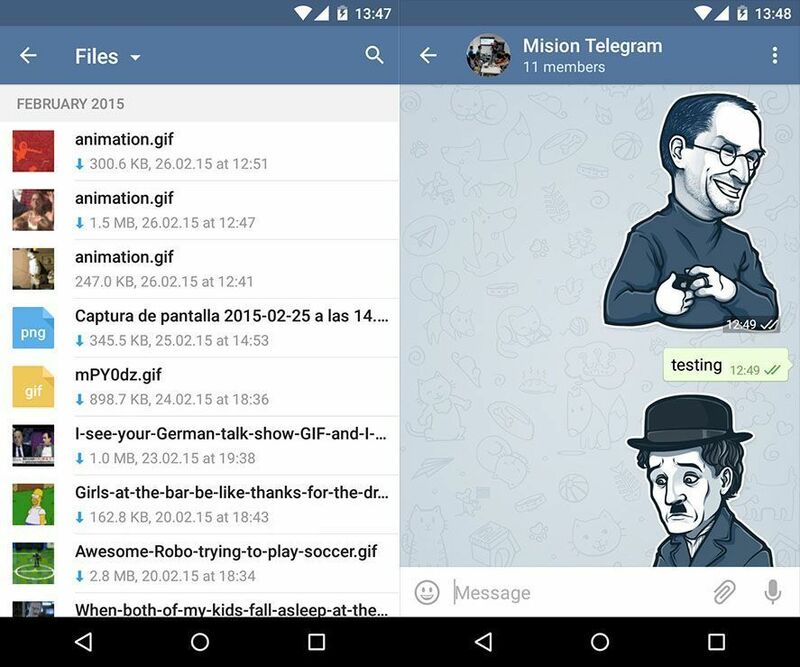 All kind of files can be sent on Telegram, from Gifs, to text documents or apps in APK format. It’s more secure: WhatsApp has just improved security through and through for sending and receiving messages via a new encryption system, but Telegram was born with security as its primary concern, meaning all its development has centered on that aspect. Hide your phone number in groups: When you are invited to a WhatsApp group with strangers in it, nothing stops anyone from seeing your phone number. Telegram hides that information by displaying just the name and photo associated with your phone. Use stickers: These are the natural evolution of emojis. As of a few weeks ago you can use 14 stickers of famous people, with the number of images soon to be increased. LINE continues to spread its ideas far from the tree. Integrated image and GIF searcher: Everybody loves sprinkling their chats with a few images and animated GIFs here and there. Telegram knows this, and lets you search photos and GIFs from the client itself to send them to your contacts and groups without having to open your browser. YOU’RE WELCOME.